From the moment David Brower first witnessed the extraordinary beauty of the Yosemite Valley, his life was tied to the fight to preserve the American wilds for future generations. Not since John Muir had an American fought so hard, or been more successful, in protecting our natural heritage. With MONUMENTAL, director Kelly Duane explores the dramatic and lyrical story of Brower and his colleagues' unrelenting campaigns - fought through lobbying, art, and hard-hitting advertising - to protect and establish some of our most treasured National Parks. At the center of the film are the very themes that absorbed Brower throughout his life: the threatened beauty of the American earth, the spiritual connection between humans and the great outdoors, and the moral obligation to preserve what is left of the world's natural wonders. Using primarily Brower's own footage, MONUMENTAL tells the story of a true American legend, an artist, a publisher, a filmmaker and a zealous crusader for the cause of environmentalism. Brower was the first executive director of the Sierra Club, and later founded both Friends of the Earth and Earth Island Institute. "Calling David Brower an important environmental activist is like calling Hamlet an important member of the Danish royal court. Brower invented modern American environmental activism. This film tells you how and why." 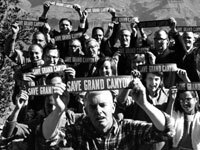 "No individual contributed more to the effort to protect wilderness in America than David Brower, and no film captures the contours and passion of that transforming effort better than Monumental. Duane's film has a freshness and originality that sets it apart from the historical documentaries that have come to dominate the genre." "In addition to its unique documentary resources, the movie should be an invaluable historical primer for anyone who aspires to influence government policy, not to mention the government officials obliged to evaluate that influence." "Stylish and substantial enough to prompt even a couch potato to action... delivers a stirring and visually dense account of the life and times of Brower...Wilderness footage makes [Monumental] richly cinematic, but it's not merely inserted. A crack team of gifted editors and a wondrous soundtrack of various bands playing dreamy rock give Brower's and friend Martin Litton's lensing a blissful lift." "An engrossing study in the power, and the perils, of charismatic single- mindedness...Duane's research is exhaustive and informative, but the film's real pleasures are Brower's own Sierra Club movies of majestic mountains, canyons and forests." "Though framed by the incendiary personality of environmental activist Brower, Monumental is as unconventional a portrait film as its subject... Brower's passion infuses every frame and proves the old adage about a picture being worth a thousand words, no matter how fiery." "This is the definitive film on David Brower." "It's great to see those 16-millimeter views of Sierrans at play among Western wonders and striking to see those sights in a grainy format instead of lurid Imax detail. There's Yosemite, the rugged Marin coast, the Nipomo Dunes. There's the young Brower and friends, basketball shoes on their feet, making the first ascent of New Mexico's Shiprock in 1939. The filmmaker's enthusiasm for that insider footage is understandable -- imagine the Rev. Martin Luther King Jr.'s home movies of the civil rights movement..."
"A magnificent achievement...a 'must see' for anyone who cares about the earth and the history of the environmental movement." "If anyone's been searching for the soul of the new West, here it is. Monumental, Kelly Duane's inspiring new-feature documentary, seizes on the renegade spirit of Berkeley native David Brower. . ."
"Monumental is an inspiring testament to the power of the individual." "Highly Recommended. [Monumental] presents the history of the environmental movement in an engaging, sometimes awe-inspiring manner... The film is technically excellent, well narrated and edited...full of unique images of the American wilderness of the past...This is a roadmap for environmental activism within 'the system' that well may inspire students to consider their roles and what they can do to ensure that wild America is conserved for them and their descendents." "See it and try not to get inspired." "His legacy is recounted in this documentary, which makes a good argument that Brower's story and the history of the 20th century environmental activism are synonymous." "A feast of nourishing images -- as well as a persuasive reminder of what exactly environmentalists are fighting for... aside from the lands he helped preserve, Monumental might well be the best depiction of his legacy." "If Rush Limbaugh and his clear-cut-crazy dittoheads could see this hauntingly beautiful documentary, even they might start choking on one of his favorite epithets, 'environmental wacko'... Flecked with contemporary interviews, saturated with terrific music and assembled with understated stylistic flourish." "Monumental should be required viewing for anyone who has ever thought to care about the environment and landscape of the American West." unsympathetic administration, MONUMENTAL is a reminder that passion and commitment CAN make a difference. "Inventive editing and a soundtrack of lively rock songs, will keep younger viewers engaged and will spur mutifaceted discussions about environmental ethics, the nature and methods of activism, and the power of one individual to make a tremendous difference in the lives of generations to come." "This lovely, inspirational film is highly recommended."